?Spongoliva ellipsoides Popofsky, 1912, Deutsche Südpolar-Exped., vol. 13, p. 117, text fig. 28. Spongoliva sp. Hollande and Enjumet, 1960, Paris, Mus. Nat. d'Hist. Natur., Archives, vol. 7, ser. 7, Pl. 63. Complete tests with two medullary shells joined by numerous (15-20 or more, confined to the equatorial region) cylindrical radial beams to the slight equatorial constriction of the subcylindrical cortical shell which, in most specimens, is present as a distinct, latticed shell, shaped like a figure 8, but with its polar surfaces not closed by a definite lattice, instead either more or less open or covered only by a few irregular bars; numerous, relatively heavy, cylindrical spines or beams arise from the surface of the cortical shell, divide into irregular branches which anastomose to form an irregular but loose spongy structure; this terminates in a definite outer ellipsoidal shell which completely surrounds the test and has an irregular but smooth surface and a definite lattice consisting of unequal, irregular pores separated by very thin intervening bars. Most tests incomplete, with polar regions undeveloped, outer spongy structure in variable state of development around the cortical shell. Inner medullary shell spherical; outer one ellipsoidal, compressed in the polar axis of the shell; both with small, subequal, subpolygonal pores. Lattice of cortical shell with large, unequal, irregular pores, smaller in the equatorial region, becoming larger and elongated in the polar axis toward each pole, 5-8 on the half circumference. 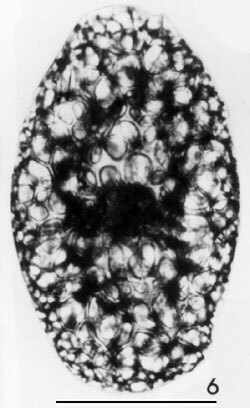 One specimen observed with a second outer shell (length 283 µm, breadth 178 µm). Measurements; based on 17 specimens from stations 46, 56, 81, 92, 106, 133, 184, and 191: length of outer shell (polar axis) 185-295 µm, of cortical shell 113-228 µm (some specimens incomplete); maximum breadth of outer shell 123-160 µm, of cortical shell 68-96 µm; breadth of equatorial region of cortical shell 54-77 µm; diameter of inner medullary shell 14-21 µm; equatorial diameter of outer medullary shell 34-41 µm, polar diameter 31-37 µm. Remarks. There is no doubt that this species is the same as the form illustrated by Hollande and Enjumet (1960, Pl. 63) and placed by them within the genus Spongoliva Haeckel. Only the outline of the figure-8 shaped cortical shell is shown, the remainder of this shell having been broken away. Popofsky's illustration of S. ellipsoides (1912, text fig. 28) is an incomplete drawing. It differs from the Gulf specimens in what appears to be a very dense, spongy meshwork at the limit of the outer shell. Popofsky shows the two medullary shells and a portion of the cortical shell, but the details of the spongy structure between the latter and the outer shell are not illustrated. His description, however, agrees fairly well with that of the Gulf species, but because his illustration lacks details, identification is not positive. Because the cortical shell of this species has an equatorial stricture it was placed within the family Cyphantellidae. Campbell (1954, p. D74) places Spongoliva within the family Sponguridae because Haeckel (1887, p. 351) did this originally. Haeckel, however, did not illustrate any of the species belonging to this genus. Subsequent illustrations (Popofsky, Hollande and Enjumet) and study of the Gulf species of this genus establish the affinity of at least these forms with the family Cyphantellidae. The affinity of Haeckel' s species of Spongoliva must await study of his type material. Distribution. This species is cosmopolitan but rare throughout the Gulf, occurring as far north as station 206. It is absent at stations 27, 95, 99, 130, 194, 203, 208, and 214. Its frequency does not undergo any significant changes; therefore its relationship to areas of upwelling is unknown. Its occurrence in the northern Gulf suggests its tolerance for waters of higher than average salinity and temperature. Popofsky (1912, p. 117) reported Spongo1iva ellipsoides from the equatorial part of the central Atlantic. Hollande and Enjumet (1960) did not discuss Spongoliva sp. but only illustrated it. It is presumably from the Bay of Algiers. The lack of positive identification of the Gulf species makes analysis of its world-wide distribution impossible. It is at least a tropical species.